Symach was founded in 2001 by Osvaldo Bergaglio in Bologna, Italy. The company started as a research project for a new technology for drying automotive paint. The results of the research project led to the development of Symach’s revolutionary drying technology called DryTronic. DryTronic drying technology allows automotive paint to cure in less than one minute. In 2002, Symach started the production of its first robot for automotive body shops called RoboDry and developed a quick new process to spray and dry every brand and type of automotive paint, called SPAP (Symach Paint Application Process). Symach has developed a complete range of equipment for automotive collision repair centers. Worldwide, the company offers a complete solution for any new body shop. 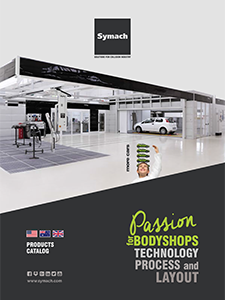 Starting in 2010, Symach began to design and install new body shops all around the world, using the Symach FixLine process. To date, Symach has sold more than 2600 robots and more than 130 complete new automotive body shops with the new Symach FixLine process in Europe, Middle East, Australia and North America starting in 2015. In January of 2016, Symach moved into a new, larger 15.000 square meter (161,500 square feet) factory in Calderara di Reno, Bologna, Italy. Symach specializes in offering a new repair process to body shops called FixLine. The FixLine repair process reduces the actual throughput time inside the shop to 1,5-2 days and also reduces an average of 3-4 hours in labor cost per repair. Today, Symach is organized to design, install and train new body shops in every part of the world. Symach has more than 30 employees as part of its international team, which includes installers, engineers and trainers. Step-by-step, Symach manages the body shop conversion, from a conventional process to the FixLine process. The company is more than a simple equipment manufacturer; it is a collision repair solution provider with a profound understanding and knowledge of the automotive collision repair process. Symach operates in full compliance with legal requirements: watch our certifications below.